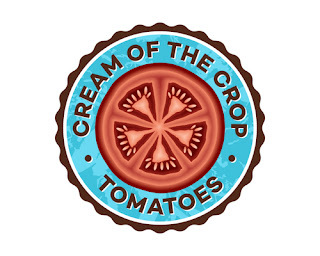 The center of origin/center of diversity for tomato is the Andean region of South America (Equador, Peru, Chile, Bolivia and Columbia). Based on the tracking of the major genes associated with domestication (e.g. 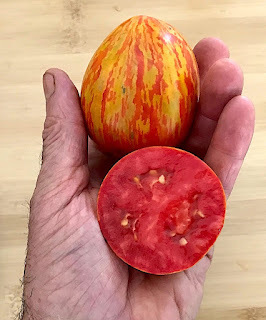 fruit size, fruit coloration, and stigma insertion) it is believed that domestication of the tomato started in South America, moved to Mexico, and then continued again in Europe after being imported from the New World in the 16thcentury. We know that the path to domestication, much of it far from the center of origin, led to a significant narrowing of the tomato germplasm base. Dr. Charles Rick, the father of modern tomato breeding, estimates that the cultivated tomato contains <5% of the genetic variation found in its various wild relatives. Modern genomic tools have been extremely useful in tracking the evolution and domestication of tomato, and have allowed measurements of both intraspecific (within species) and interspecific (between species) genetic diversity in tomato and wild relatives. 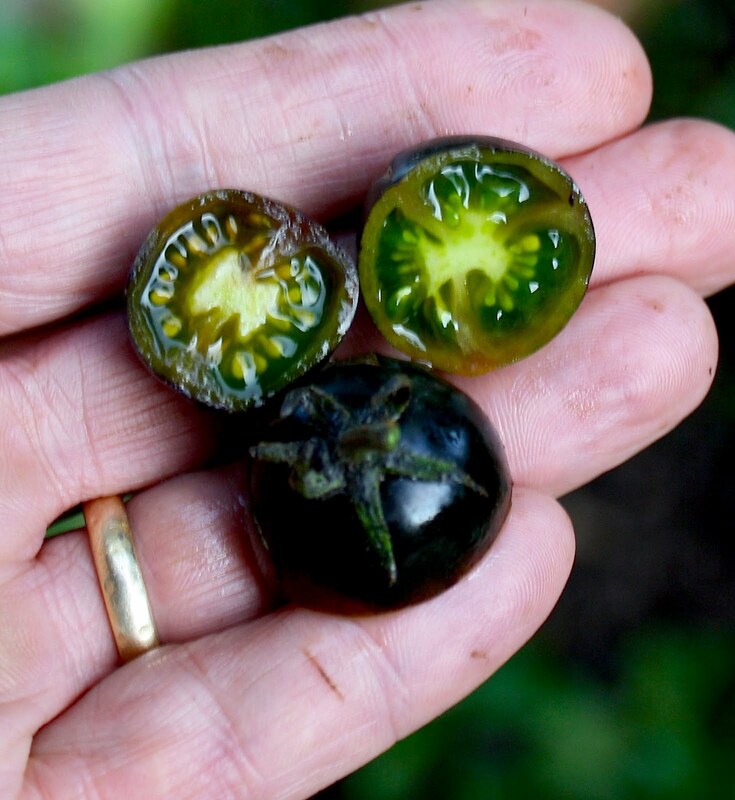 The results reveal an interesting puzzle – Solanum lycopersicum (cultivated tomato) has very little intraspecific genetic diversity compared to wild relatives, yet has substantial and obvious phenotypic diversity in fruit size, shape and color – all developed as part of, or post-domestication. The wild relatives have evolved for centuries in multiple micro-climates in the northern Andes and contain enormous genetic diversity, especially for traits related to tolerance to biotic and abioitic stresses, but have little phenotypic diversity for fruit size (small), shape (round) or color (green, with the exception of red color of S. pimpinellifolium and the orange color of the species native to the Galapagos). Interspecific genetic variability between tomato and wild relatives. 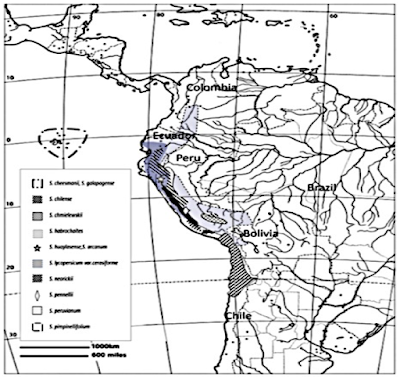 There are 12 wild relatives of cultivated tomato (Solanum lycopersicum), ten of these are endemic to western South America from Ecuador to northern Bolivia and Chile, and two found only in the Galapagos Islands (see map below). 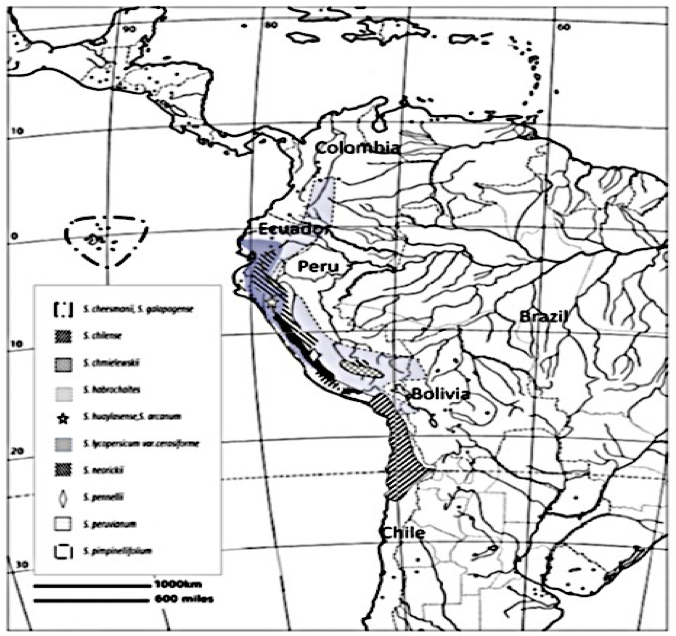 These species, and associated sub-species, have evolved specific adaption to numerous micro-environments within the geographic area shown on the map. This includes desert-like high elevation environments, as well as wet sub-tropical coastal environments. 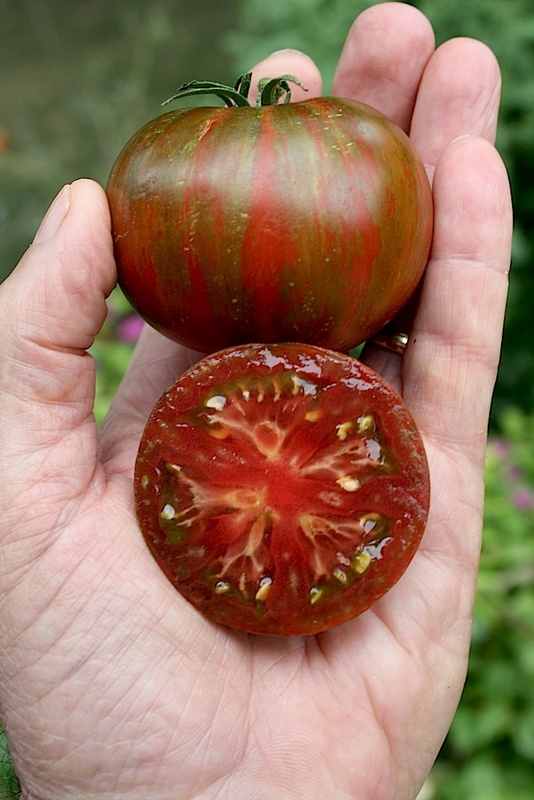 As noted above, these related species are all small fruited and most, unlike cultivated tomato, are cross- pollinated. 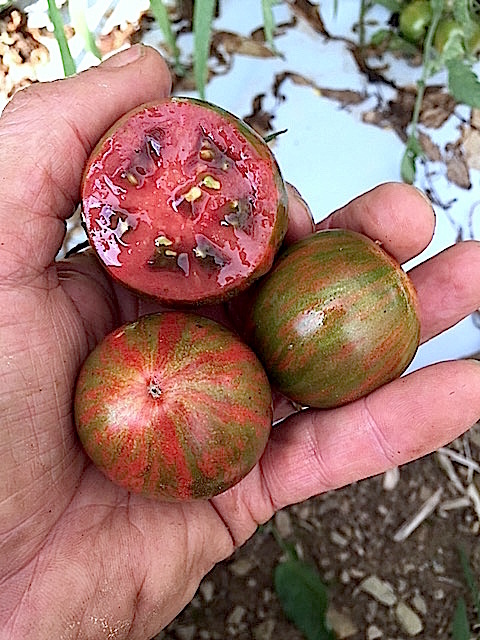 Solanum cheesmaniae, S. chilense, S. habrochaites, S. pennellii, S. peruvianum and S. pimpinellifoliumhave been the most widely used wild relatives in tomato breeding. All six of these related species are cross compatible with cultivated tomato, though fertility is much better with some species than others. The substantial genetic variation within these wild relatives has been a rich source of genes for resistance to various tomato pathogens, and a source of genetic variation for other traits for which such variation is lacking in cultivated tomato. In addition to numerous key disease and nematode resistance traits, which have almost exclusively been introgressed from crosses with wild relatives, the delayed ripening/ESL mutant allele “rin”, the “sp” mutant for determinate growth habit, the genes/alleles controlling length of fruit truss, Aft (anthocyanin fruit), the “j2” mutant for the jointless trait and genes associated with increased soluble solids (brix) and sugar composition are also derived from wild relatives (Bauchet and Causse, 2012). There is ongoing research on mining wild relatives for genes associated with improved water use efficiency, salt tolerance, and production of specific flavor enhancing volatile organic compounds. 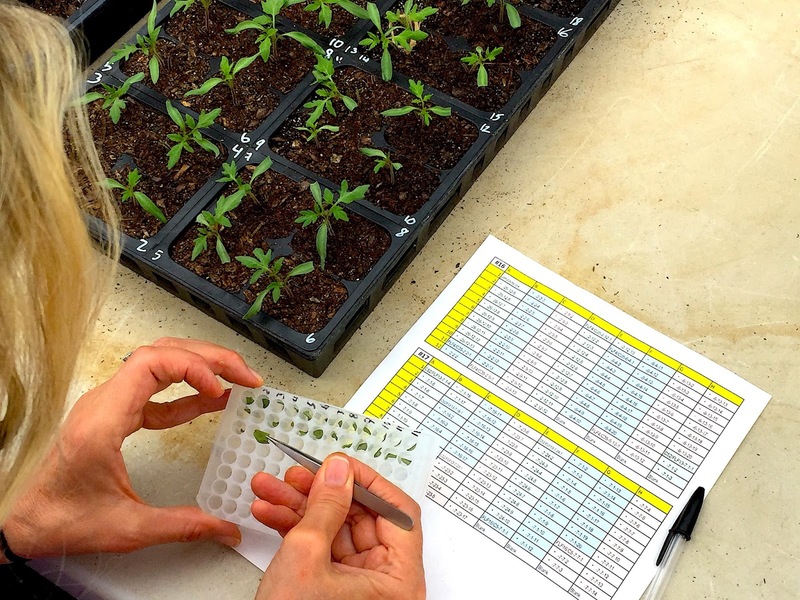 The Charles Rick Tomato Genetic Resource Center at UC Davis maintains a vast germplasm collection of wild relatives and other diverse genetic stocks for use by tomato scientists and breeders. 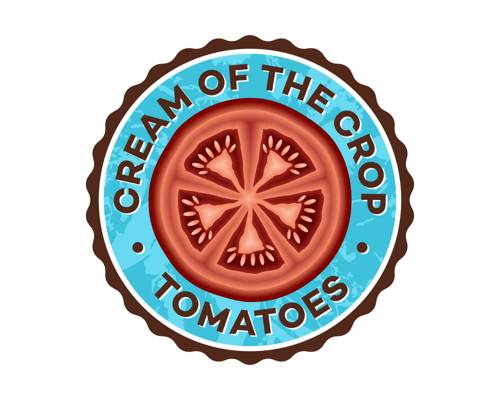 The tomato varieties grown in the U.S. trace primarily to the large fruited types developed in Europe over the last 300 years, and brought to America by early settlers. 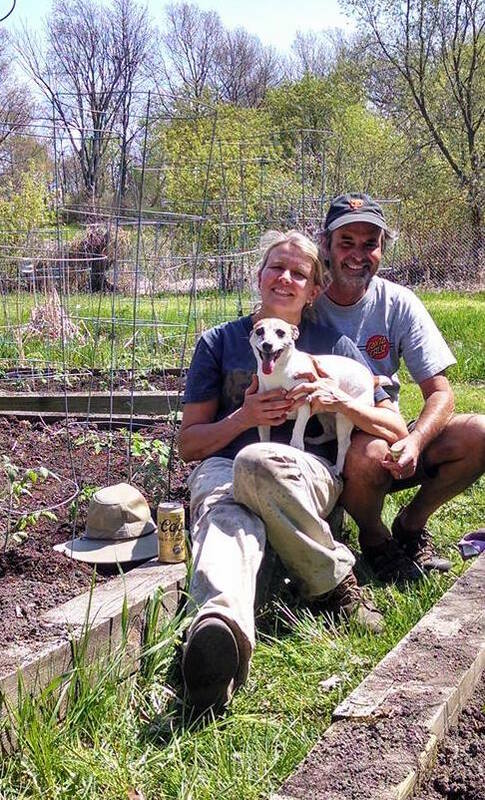 Family favorites benefitting from additional selection in America for taste and adaptation, and countless generations of seed saving, are today’s heirlooms. It is generally believed that the strong selection for large fruit in the domestication of tomatoes, selection for much of which happened a great distance from tomato progenitors and relatives, resulted in a significant narrowing of the germplasm base in cultivated types. (Estabrook, 2015). In reference to the relatively narrow genetic variability in tomato and the great diversity in fruit size, shape and color, Steven Tanksley, a leader in tomato molecular genetics, says “The irony of all this is all that diversity of heirlooms can be accounted for by a handful of genes. 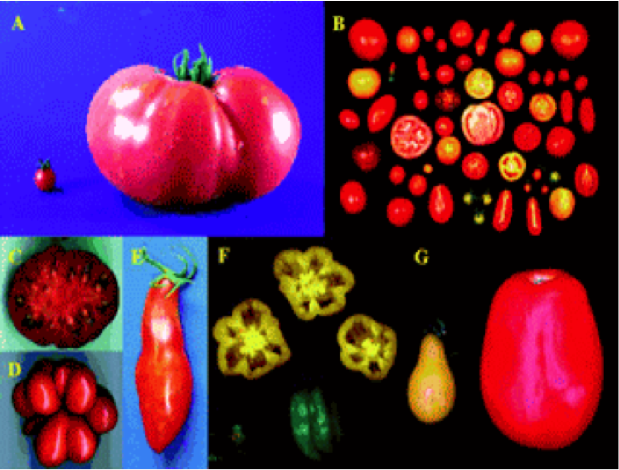 There are probably no more than 10 mutant genes that create the diversity of heirlooms you see” (Borrell 2009). The image below (Tanksley 2004) shows the diversity in size and shape due to just four genes: LC (locule #) OVATE, FAS (faciated) and SUN. 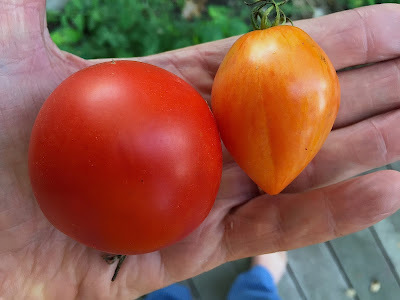 The exciting variation in fruit color that we see today in tomatoes is due to mutant alleles for a few key genes/enzymes in the biochemical pathway that produces lycopene, and related carotenoid pigments (reference). 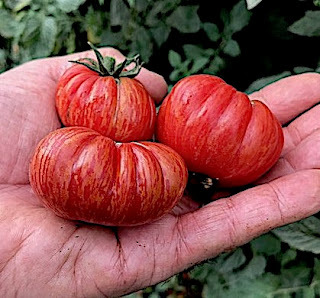 Breeders today have a rich genetic toolbox for designing O.P varieties or hybrids that vary greatly in fruit size/shape, fruit color/striping, earliness, plant stature/growth habit, and resistance to >15 key tomato diseases and nematodes. This genetic toolbox is a combination of traits/alleles developed within S. lycopersicum during and after domestication and genes introgressed into cultivated tomato from wild relatives. Many of these interesting traits have been linked to molecular markers, making MAS (marker assisted selection) a particularly useful tool in stacking multiple desirable traits. Genetic diversity studies also clearly show significant divergence between fresh market and processing types. Crosses between these market types have shown interesting trait combinations. The lines below demonstrate some of the phenotypic variability available to breeders today (FLF photos). 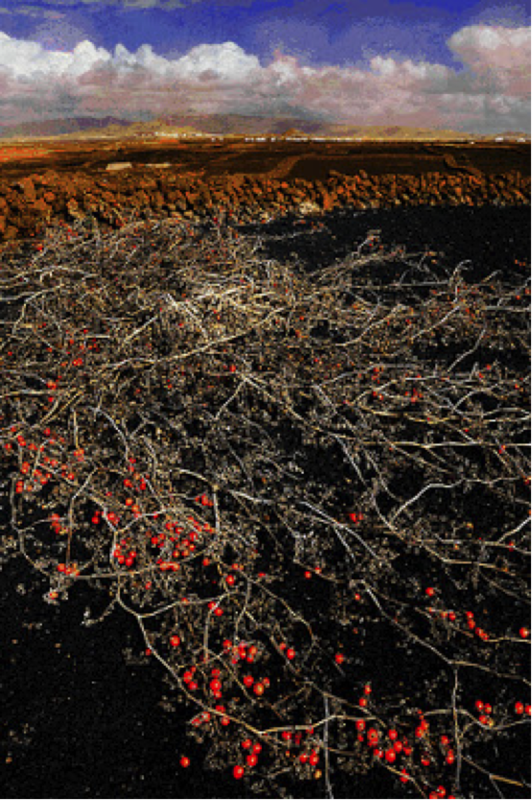 As new challenges and opportunities arise, such as new pathogens or novel races of existing pathogens, adaptation to changing climatic conditions, and the development of new tools for improving fruit flavor – it is likely that tomato scientists will again rely on wild relatives as a necessary source of genetic variability. Thankfully there is a very vibrant international public research scientific community doing the “heavy lifting” behind the scenes to identify these opportunities. The heavy lifting includes not just finding a source for the desired genes, but also developing appropriate molecular markers tightly linked to the gene and “pre-breeding” - backcrossing the new trait into cultivated lines to generated NILs (near isogenic lines) which contain the desired gene with minimal effects of linked genes having an undesirable negative impact on one or more other traits. 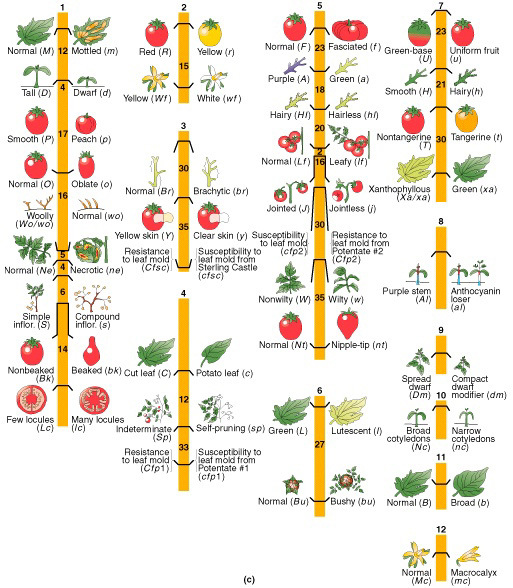 Most tomato enthusiasts are unaware of the significant contributions to tomato made by germplasm from wild relatives and of our reliance on such novel genetic variation for future breeding progress. Kudos and thanks for the C.M. Rick Tomato Genetic Resource Center, the World Veg Center, other such international centers, and the global public tomato research community for their outstanding work. 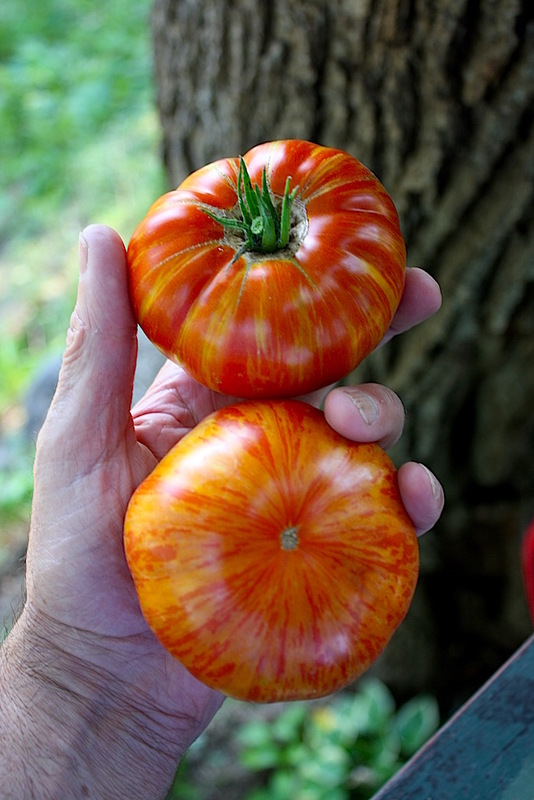 Heirloom type tomatoes are the result of generations of selection for flavor. However they typically lack other elements of fruit quality, such as tolerance to cracking/splitting and improved shelf life. Some heirlooms have low-level tolerance to some disease complexes, but lack the resistance to specific tomato pathogens that can greatly improve plant health and productivity. On the other hand, many new commercial hybrids have multiple pest resistance to key disease and nematode pests, and improved tolerance to splitting, cracking and cat-facing. Some commercial hybrids also demonstrate significant improvement in shelf life when compared to heirloom types. However, strong selection pressure for fruit quality, fruit yield, plant health and traits that make the fruit “transportation friendly” has led to commercial hybrids that typically lack the excellent flavor of the best heirloom types. The breeding challenge is to efficiently and effectively combine the great flavor of the best heirloom types with the improved plant health, fruit quality and productivity of newer commercial hybrids. 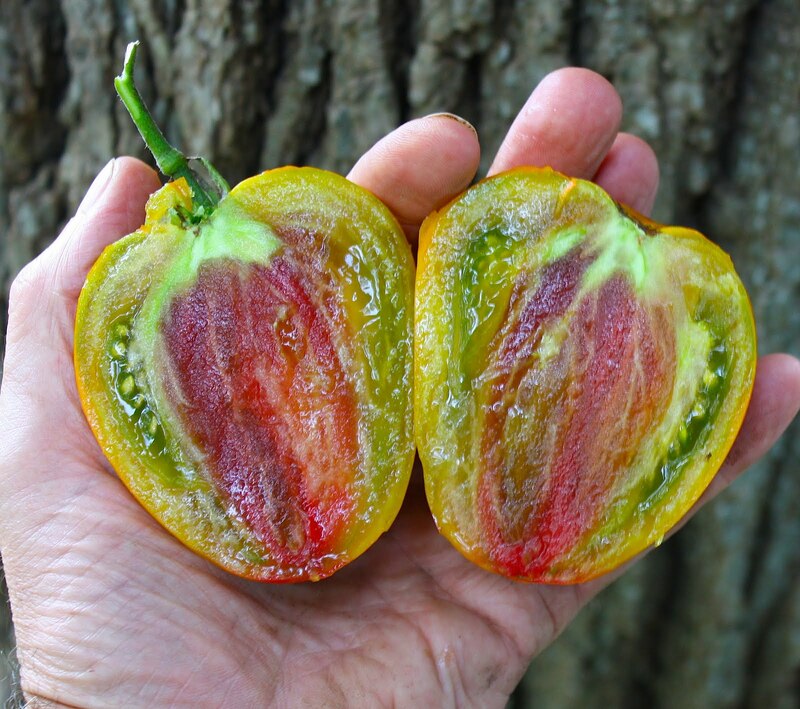 Harry Klee and colleagues at the University of Florida have attempted this by crossing a disease resistant commercial parent line to flavorful heirloom types to create novel hybrids (e.g. Garden Gem and Garden Treasure). A step in the right direction perhaps, but it is a quick fix that likely falls short of what could be achieved in a breeding program designed to preserve or enhance flavor and stack dominant pest resistant genes on both sides of the hybrid pedigree. Introgression of traits associated with plant health (e.g . pest resistance) and fruit quality (e.g. tolerance to cracking) from newer commercial hybrids into selected heirloom types provides an opportunity to capture the “best of both worlds” in multiple parent lines that can be used to produce novel hybrids with a combination of high flavor, high yield, high fruit quality and multiple pest resistance/improved plant health – a trait combination that does not exist in the market today. University tomato researchers have done an outstanding job of identifying sources of resistance to key tomato pests in tomato wild relatives, and then finding a molecular marker that co-segregates with the desired gene for resistance to the specific disease or nematode. Selection for the associated genetic marker (i.e. marker assisted selection or “MAS”) allows tomato breeders to efficiently identify plants that carry the desired pest resistance gene (MAS reference). 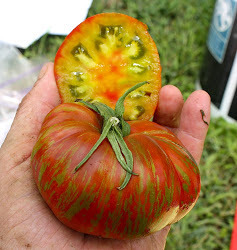 Combining MAS with phenotypic selection in breeding populations derived from crosses between heirloom types and commercial hybrids allows the design of a breeding program that, over several generations of selection, stacks multiple pest resistance genes into stable inbred lines which have also been selected for high flavor and fruit quality. After 8 generations of MAS genotypic selection and two cycles of field phenotypic selection for flavor, fruit quality and fruit yield, we have created our first generation of multiple pest resistant experimental hybrids. These were evaluated in open field and greenhouse trials in 2018. We were able to document the multiple pest resistance (up to 10 pest resistance genes) of the hybrids and found individual test cross hybrids with heterosis for both fruit yield and fruit flavor. The best of these new hybrids tasted as good as or better than our best heirloom-derived lines, with generally improved fruit quality characteristics. The first generation hybrids are cherry to saladette size – larger fruited types are a year or two behind. The initial crosses were designed to generate breeding lines segregating for fruit color and stripes, so a diversity in fruit color, shape and size will be available in these new hybrid products. In parallel we have been working on improving shelf life by selection per se, and by incorporating mutant alleles of RIN or NOR - key genes regulating fruit ripening in tomatoes. Extended shelf life (XSL reference) will be a key feature of several of our new Cream of the Crop TomatoTM multiple pest resistant hybrids. 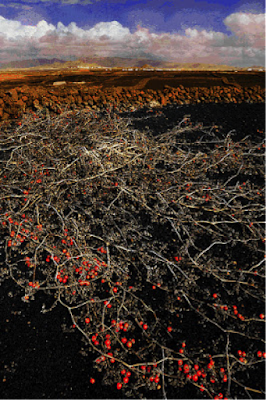 Tomato is one of many plants that have evolved an “edible fruit” strategy for seed dispersal. Mature seed is encased in a fruit designed to be attractive for consumption by fruit eating animals. Seed dispersal occurs when the consumed seed passes safely through the digestive tract and is deposited with feces on the soil some distance from the mother plant. In tomato the fruit ripening process involves several steps designed to enhance attractiveness for consumption: an increase in fruit sugars, acids and flavor-enhancing aromatic compounds that greatly improve tastiness of the fruit; fruit softening to a more edible texture; and obvious fruit pigmentation designed to signal to passing animals that the fruit is fully ripe and ready to eat. 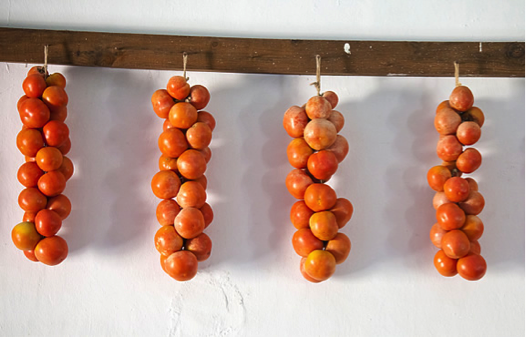 These features were preserved during the domestication of tomato and the more recent development of tomato as one of the world’s most important fruit/vegetable crops. One of the modern dilemmas in tomato production and breeding relates to managing post-harvest losses associated with the modern agricultural practice of concentrated fruit production in one area and fruit consumption in another place (and time). Ripe fruit is easy to damage in transit and deteriorates relatively quickly. 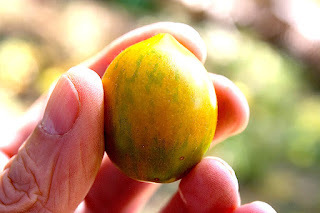 Picking mature green (MG) fruit for shipment and gassing with ethylene at a distant delivery point to “ripen” the fruit solved the problem of damage in shipping, but comes with an unfortunate sacrifice in flavor. As an alternative to this practice plant biologists and tomato breeders have looked at various genetic variants (mutations) in genes controlling the ripening process, and examined how these novel alleles might be deployed in the development of varieties with great flavor and enhanced shelf life. In this post I’ve tried to summarize the current understanding of this field and share some of our related breeding efforts. Tomatoes are a climacteric fruit, which means that the plant hormone ethylene is required for fruit ripening. Ethylene is rapidly produced in tomato fruit at the breaker (BK) stage and drives a series of reactions that together define the fruit ripening process. During normal ripening there are simultaneous and independent processes that lead to 1) accumulation of sugars, organic acids and volatile organic compounds influencing flavor, 2) conversion of chloroplasts to chromoplasts and the synthesis and accumulation of carotenoid pigments and 3) softening of the fruit. In a perfect modern tomato, ripening steps 1&2 proceed normally and step 3 proceeds at slow rate – allowing the tomato fruit to keep peak flavor, color and texture for an extended period of time. 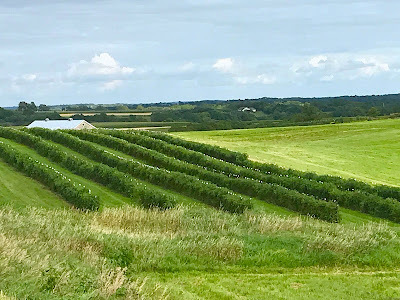 ESL, or extended shelf life, is a term describing a collection of traits that together extend the potential time between picking of fully ripe or nearly fully ripe fruit, and the deterioration of fruit quality. Fruit quality deterioration is usually associated with fruit softness/undesirable texture and fruit rotting. Taste panels have identified fruit texture as an important determinant in consumer preference, and soft or mealy fruit is a major “turn-off”. Deterioration in fruit firmness/texture is generally associated with a ripening related spike in polygalacturonase (PG) and other enzymes that degrade fruit cell wall polysaccharides. Thus, a decline in fruit firmness typically coincides with dissolution of the middle lamella and hemicellulosic/pectic cell wall polysaccharides, thereby undermining the polysaccharide network that hold cells together in the fruit pericarp. FlavrSavr tomato, the commercially unsuccessful GE trait introduced by Calgene in 1985, was designed to specifically suppress PG activity in ripening tomatoes. Recent research has also implicated cuticle composition and architecture as traits influencing ripening-induced fruit softening (Saladie et al. 2007 and Kosma et al. 2010). The cuticle has long been implicated as a contributor to fruit strength, and cuticle structure changes during the ripening process. Kosma et al, show that during the ripening process ESL mutants generally have cuticles with mechanical properties significantly different than the wild type – likely contributing to ESL per se. 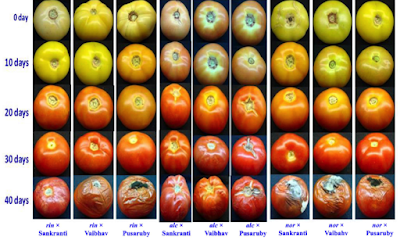 It should be noted that independent of the several novel mutant alleles described below, there are significant genetic differences in firmness in tomatoes. Unfortunately there are a couple of studies that report fruit firmness at harvest is not well correlated with the maintenance of fruit firmness postharvest. We have found that pericarp thickness, relative to size of the locules, is a heritable trait that significantly impacts firmness per se, and appears in many cases to be associated with improved shelf life (see photos below). This combination of traits is common in many newer commercial hybrids. There are several mutations in key structural or regulatory tomato genes that affect the ripening process. These genes generally either inhibit ethylene synthesis and/or modify ethylene’s downstream effects on specific biochemical processes related to fruit ripening. 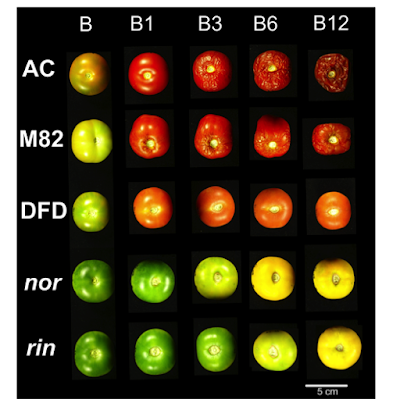 To better understand climacteric fruit ripening per se, and to examine the potential utilization of these mutant alleles for delayed ripening/extended shelf life – tomato scientists have characterized several mutant alleles associated with a delayed ripening phenotype. Several key ripening mutants are described in detail below. rin = ripening inhibitor. The RIN gene is a transcription factor that acts as a master regulatory gene controlling numerous genes and pathways associated with tomato fruit ripening. The rin loss of function mutant is a recessive allele that both represses genes associated with ethylene synthesis and modifies downstream processes associated with the normal ripening process. 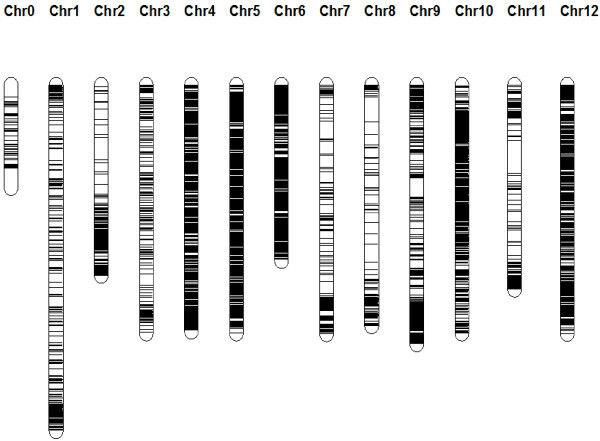 Specifically rin modifies expression of other transcription factors associated with fruit ripening (e.g. NOR); prevents normal fruit pigmentation by suppressing synthesis of Phytoene synthase (PSY), the primary enzyme regulating flux into the carotenoid pathway (see Genetic Control of Fruit Color in Tomatoes); suppresses key steps in the accumulation of sugars, organic acids and aromatic compounds associated the improved flavor in ripe tomato fruit; suppress enzymes (e.g. polygalacturonase = “PG”) associated with breakdown of cell wall polysaccharides that lead to ripening-related fruit softening; and modifies cutin and fruit wax content and composition. 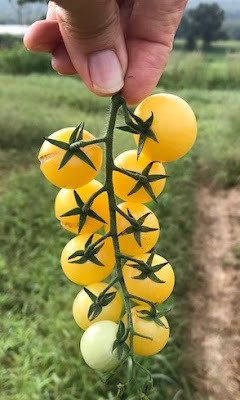 The rin/rin homozygote plant produces fruit that never fully ripen and have much firmer fruit with a significantly longer shelf life (see photo below). The lack of normal color and flavor significantly limits commercial potential of rin/rin plants. In the heterozygous condition rin/+ plants produce fruit with near normal fruit color and flavor, and shelf life that is intermediate between rin/rin and +/+ (wild type) plants. F1 hybrids with the rin/+ genotype and extended shelf life have been widely commercialized and are a key driver in the recent availability of “vine ripened” tomatoes in grocery stores. The extended shelf life allows picking at or near the full ripe stage when flavor is near peak, and remaining firm for an extended period of time for shipping to distant locations. We have been developing and testing new rin/rin inbreds and rin/+ hybrids for the last few years. Although rin/rin lines generally have very low fruit sugars, there are differences in sugar levels between rin/rin lines. The sweetest rin/rin lines generally produce the sweetest rin/+ hybrids, though this is also heavily influenced by the non-rin parent in the hybrid. 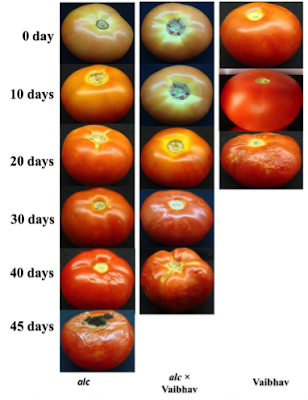 Lycopene levels in rin/+ hybrids is a little lower than wild type (orange/red vs dark red), but normal red color can be restored in ogc/ogc crimson types (e.g. Mountain Magic). Enhanced shelf life in rin/+ hybrids appears to be influenced by rin per se, but also on the genetic background of the rin and wild type parents, specifically those genes influencing fruit firmness. Ripening is a little slower with rin/+ hybrids, adding perhaps 5-7 days. We are making great progress on rin/+ hybrids and it appears possible to combine a significant improvement in shelf-life with exceptional flavor in fruit in a wide range of colors, shapes and sizes. nor = non-ripening. The NOR gene is an unrelated transcription factor that also serves as a master regulator of fruit ripening in tomato. The recessive loss of function mutant allele nor has been widely studied. The nor/nor homozygote has a very similar phenotype to rin/rin, and nor/+ hybrids also have much restored color and flavor with extended shelf-life – though reports in the literature suggest less color and flavor and longer shelf life in nor/+ relative to rin/+. The specific mechanisms for modification of ripening in nor mutants is less understood than with rin – but like RIN, NOR helps regulate multiple genes and pathways important in tomato fruit ripening. Commercial nor/+ hybrids have been commercially successful, though probably less so than rin/+. Note that the next few mutants described here, alc and dfd, are thought to be allelic to nor (i.e. independent NOR mutants) with subtle but significant differences in ESL phenotypes. dfd = delayed fruit deterioration. The dfd trait was first found in certain ecotypes growing in the southern Mediterranean. The literature suggests that dfd is a partially dominant mutant allele of NOR, and may indeed by identical to or a slight variation to alc. DFD controls cuticle composition and leads to decreased cell water loss, increasing cell turgor (firmness) per se, and decreasing fruit water loss generally during ripening. Normally as tomato fruit ripen the cuticle weakens and grows less resistant to penetration. Fruit of dfd plants require significantly more force for cuticle penetration than those from wild type varieties, and do not exhibit a normal progressive weakening of the cuticle during ripening. Fruit from dfd plants exhibit the normal ripening-induced fruit cell wall breakdown and cell separation typical of wild type, but show substantial swelling of pericarp cells during the ripening that is atypical, with a ~4x increase in cell size vs wild type in ripe fruit, likely related to increased cell turgor. There is also less fruit water loss in dfd vs wild type ripening fruit – another contributing factor to improved fruit firmness. Increased cell turgor, decreased fruit moisture loss and increased cuticle strength all appear to be related to changes in cuticle wax content and composition in dfd vs wild type. Unlike rin, and nor, dfd’s affect on fruit firmness/LSL was independent of normal fruit coloration and ripening-related accumulation of sugars and organic acids. Futhermore dfd/dfd plants maintained firmer fruit without impacting expression of genes, such a PG, involved in ripening induced cell wall degradation (unlike alc). The dfd mutant appears to represent a very novel approach for ESL that may be used in combination with other ESL traits to enhance shelf life in tomato hybrids or O.P. varieties. Nr = never ripe and Gr=green ripe. These are dominant, gain of function mutations at independent loci, that each results in reduced ethylene responsiveness in tomato fruit tissue. The ethylene insensitivity in both Gr and Nr have a negative impact on seed germination and seedling vigor and completely prevent normal fruit ripening. Negative plant and fruit phenotypes prevent any commercial use of these mutant alleles. Although the mutant alleles rin, nor and alc generate a somewhat similar ESL phenotype in plants heterozygous for these alleles, rin and nor are independent loci and all three have different modes of action. With all three alleles, extended shelf life is associated with later maturity, and with rin and nor also associated with decreased pigmentation (see photo above). The mutant alleles of these three genes have a similar effect on extending shelf life, and the maintenance of firmness is due both to the mutant alleles per se, and the background genotype of both the male and female parents. We have found that a rin/+ genotype in a firm fruited background can extend shelf life for over two weeks. In such a case a fruit picked fully ripe can stay crisp and firm on the countertop (or in transit to local or distant markets) for at least 14-21 days. Since several of the key aromatic compounds impacting flavor are directly derived from lycopene and other carotenoid pigments, in theory one might expect that the lower carotenoid pigment content of rin/+ hybrids might lead to lower flavor. However by selecting ruthlessly for flavor in parent lines, we have been able to identify rin/rin parents that contribute high flavor to rin/+ hybrids. It is currently unclear how closely related are the NOR mutants nor, alc and dfd. The dfd mutant is somewhat of a mystery, perhaps due to a Cornell patent filing on a specific dfd sequence – in the patent they do describe this as a NOR mutant derived from a Mediterranean ecotype. To complicate matters more a Davis, CA company Arcadia has patented an induced mutation in NOR (reference), which they claim to be an improvement on the naturally occurring nor loss of function mutant. It is too early to know how similar the Arcadia mutant might be to alc or dfd. 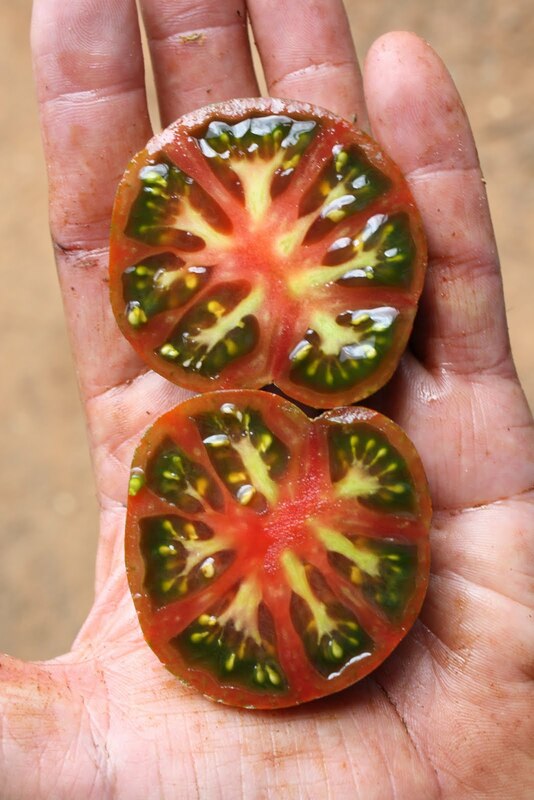 The primary use of extended shelf life (ESL) tomato hybrids will likely be for medium/large size grower (field or protected culture) producing for distant markets. Picking an ESL hybrid at or just before full ripening (in the marketplace = vine ripened) then packing and shipping, can be a consumer and taste-friendly alternative to the traditional “green and gassed” model. We think ESL types will also be well suited to smaller producers selling in more local markets. 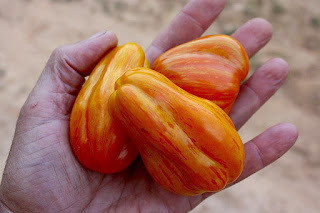 These types could be picked less frequently, and once picked, be much less prone to post harvest losses. It appears there may be several different gene/allele options for ESL, with varying efficacy, ease of use, and freedom to operate. We think ESL will be an increasing important trait for fresh market tomatoes, with perhaps evolving breeding strategies for optimization of the trait. We will build on our early success with rin, and continue to follow and explore the other options described here. Our multi-year effort in selecting for fruit firmness and flavor per se is paying off – deployment of rin or one of the NOR mutants will likely require a firm fruit background for optimization of ESL, and a high flavor background will likely be needed to counter the delayed ripening effect of rin/+, nor/+, or alc hybrids.